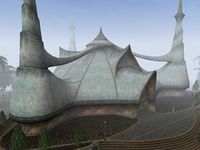 Mournhold, "the city of light and magic", is a Temple city inside the capital of Morrowind, and the heart of this larger city, Almalexia, named after the goddess. Mournhold is located on the southeast mainland, in the district of House Indoril. The Royal Palace forms the center of the city and is home to the new King and his mother Barenziah, who are protected by a Royal Guard garrison and offers Imperial Cult services. The Temple to the north houses the High Chapel, home to Almalexia, one of the living gods of the Tribunal Temple. It also rooms offices of the Archcannon, an infirmary and the personal guard of the goddess, The Hands of Almalexia. Mournhold is the setting for the game Tribunal, but the city isn't totally accessible during the game. Godsreach is on the west side of Mournhold and is home to the wealthier residences of Morrowind. Located here are manors, The Craftsmen's Hall, a tavern, and the Mournhold Museum of Artifacts, all with their own services and Related Quests. One of several entrances to the Mournhold Sewers is located in Godsreach. It is connected to the Temple Courtyard (North Gate) and Plaza Brindisi Dorom (South Gate). Godsreach, and to some extent the Great Bazaar, is the main residential and tourist area. The Great Bazaar is the merchant quarter of Mournhold. 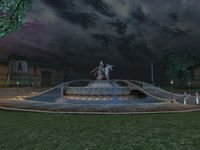 There is an outdoor theater for the Mournhold Players located on the west side of this quarter. The east side, the main bazaar area, has two rows of shops. The north row has a magic shop, armorer, and bookseller. The south row has a clothier, pawnbroker, and trader. At the very south corner of the Great Bazaar is the entrance to the Bazaar Sewers. Besides the sewers, the Great Bazaar is connected to the Temple Courtyard (Northeast Gate) and Plaza Brindisi Dorom (Southeast Gate). The Plaza Brindisi Dorom occupies the southernmost quadrant of Mournhold. It is a public garden dominated by a great statue at its center. It is connected to Godsreach (west gate), the Great Bazaar (east gate), Royal Palace (north gate), and Bamz-Amschend (Statue). 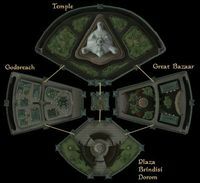 The Royal Palace is the living quarters for the royal family and the business center for the affairs of Mournhold and the rest of Morrowind. It is also the place where you may return to Vvardenfell via teleport. The palace is in the center of the city and is accessible from the Temple Courtyard, Plaza Brindisi Dorom, and the Palace Sewers. 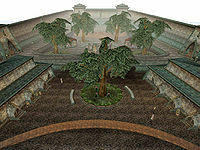 The Temple Courtyard is an enclosed area with paths, water, and trees that is dominated by the massive temple to Almalexia. It is connected to Godsreach, Royal Palace, and the Great Bazaar. See Tribunal:People; almost all of them are within Mournhold. Effe-Tei provides teleportation to Ebonheart in Vvardenfell, while Asciene Rane provides teleportation to Mournhold. The details of getting to Mournhold the first time can be found on the Dark Brotherhood Attacks page. Almsivi Intervention takes you to the door of the Temple, while Divine Intervention will take you to the Courtyard of the Palace. Levitation is forbidden in Mournhold as it is offensive to the goddess Almalexia. Throughout the city are trapdoors leading to the sewers and the vast ruins of Old Mournhold. Mourhold's apparent exterior cells are in fact interiors made to look like exteriors. This is real reason levitation is disabled there – if one used it to fly over the walls, one would find nothing very far beyond them. Similarly, the main gate in Plaza Brindisi Dorom, which ostensibly would lead out of the city-within-a-city of Mournhold, is disabled. Bethesda did not develop the larger surrounding city of Almalexia. Mournhold has no in-game exit other than fast travel back to Ebonheart via Effe-Tei. This page was last modified on 16 November 2018, at 06:32.